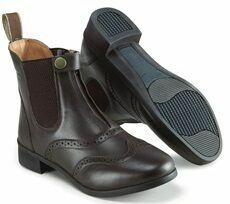 The Harry Hall Eston Junior is a high quality leather jodhpur boot. The zip front with fold over zip guard makes putting on a quick and easy process. Oxford styling at the toes and elasticated side panels ensure a comfortable fit. Finished with an impact absorber and pressure absorbing comfy gel insole these boots are comfortable for wearing all day, everyday.